Nice is located in the region of Provence-Alpes-Côte d'Azur, and is the fifth largest city in France. Local food culture, which includes pissaladière, a pie with onions and anchovies paste; socca, a type of pancake made from chickpea flour; bouillabaisse and various fish soups; "Stockfish" (traditionally pronounced as "Stoquefiche" (French spelling) with special emphasis on the first "e"), farcis niçois, vegetables stuffed with breadcrumbs; and salade niçoise, a tomato salad with green peppers of the "Corne" breed, baked eggs, tuna or anchovies and olives. In the past Nice welcomed many immigrants from Italy (who continue to make a large proportion of the population), as well as Spanish and Portuguese immigrants. However, in the past few decades immigration has been opened to include immigrants from all over the world particularly immigrants from other parts of the world, mainly former Northern and Western African colonies, as well as southeastern Asia. Traditions are still alive, especially in the folk music and the dances. The most famous is the farandole. 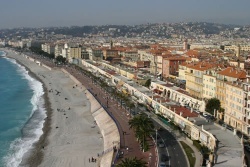 Nice enjoys mild and sunny weather throughout the year. Its mediterranean climate allows warm summers and mild winters, with temperatures rarely reaching freezing point. Sometimes the temperature can even reach 20°C in late winter or early spring, as it did on 2 March 2007 with a record high of 26°C. Snowfall is extremely rare. This page was last modified on 12 April 2007, at 00:12.